It has been a week since Test Drive Unlimited 2 released here in Australia and in that time I've played it every night to get a good sense of what it is like, how it compares to the original game and whether it delivers on the expectations I had for it. Part of the games that I deem to be my "big four" of 2011 -- the rest of which will be revealed closer to their release dates (though if you know me, it wouldn't be hard to guess) -- TDU 2 was, naturally, high on my anticipation list. So does it deliver? In terms of what I was interested in it for -- that of going for a simple drive in any car of my choosing and going wherever I may have wanted -- yes it does meet my expectations. What surprised me, however, was how long it took for TDU 2 to achieve that. The game's opening segment, to put it nicely, is mediocre, the various cutscenes that make up the filler story (complete with horrendous voice acting) and the many tutorials and licenses that follow combining to bring the game down, not to mention misrepresent what it's actually about and why that can be so great. Instead of great open roads and fast cars you have silly introductions and linear tasks with annoying people telling you what to do. Instead of freedom you are restricted to missions -- take someone to work while she insults (or praises, depending on your skills) your driving style or talks on the phone to four different people; slide around corners and get dangerously close to other vehicles to build up your F.R.I.M (free ride instant money) device’s meter -- that are boring, mindless and definitely not what you want to be doing in the game: driving fast cars, however you see fit. Combined with the need to participate in races and random missions early to get established and build up some funds to enjoy the freedom that comes later, it’s grating and unnecessary, and I wouldn’t be surprised if the initial hour with the game turned a lot of people off. I’ll have more on this opening segment soon but, needless to say, I wasn’t impressed. A much more pleasant surprise was the off-road races and routes in general. I went in expecting nothing more than a temporary diversion, a simple distraction to break up the pace of the game and give players something new to do for a while. Instead, I got dirt roads that flowed really nicely and took me to some interesting landmarks; handling that reminded me of the various rally games I have played over the years (hand-braking around a hairpin never gets old); and even more incentive to explore the game’s two large islands. This is something I have embraced with open arms and, when combined with the day/night cycle -- it’s a delight to cruise down a highway with the stars in the sky and the piercing glow of headlights coming and going as traffic passes by -- and dynamic weather, creates the kind of experience I wanted Test Drive Unlimited 2 to bring: an enhanced version of the original game, maintaining everything I loved about it while also adding new things for me to play with. It isn’t perfect, it contains a lot of unnecessary filler, and it takes too long to get to the good stuff, but TDU 2 does deliver -- eventually -- and as such I can’t help but think of my next drive: where I will go, what I will find and, of course, how fast I will go. If that’s not car enthusiasm as its finest, nothing is. I am not much into racing titles but this does seem something like I would pass. Usually if a game doesn't grab my attention in the first couple of hours I usually call it quits and choose another game. It is a bummer that you are forced into the missions from the start. Call me a simpleton but my taste for gaming as of late has been games that let you get to the excitement sooner then later. I am always so busy with work and my wife that I need games that get more to the point. On another note about the game, the weather effects do seem to add more realism but sadly seems to be ruined by the horrible plot line. Gaming in Public -- The game is great once you get out on the roads with no one or nothing pestering you and you can do what you please. 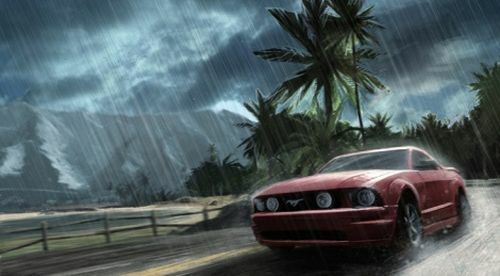 Championships and events can be done when you want to (though as I said in the post, if you want money for the better cars you're going to have to do some of them just to get established) and just driving around is as fun as it was in the original game, if not more so with two islands. It's just that initial hour that is really mediocre and it's really down to whether you can endure that or not. As I said to you the other day, there are some elements of the game that you would probably really like so now that I've gone and confused you with my contradictive statements, perhaps a rental is in order so you can make up your own mind? It is a good game. I hope this post doesn't suggest otherwise. @Steven O'Dell- Well maybe when they lower the price but for now will concentrate on Tatsunuko vs Capcom which i just got the other day. I needed a new reason to turn on my Wii. Gaming in Public -- I have reason to turn on my Wii, what with Donkey Kong Country Returns not finished and games like Epic Mickey and Little King's Story still waiting on the shelf to be played. Unfortunately, though, because I had to slow down my gaming in order to focus on a couple titles I just haven't been able to get to those (or any others) yet and both my PS3 and Wii haven't been turned on in a couple of months. All in good time, I suppose.